In the spirit of the first pioneering Sisters who arrived to teach the children of Polish immigrants, we continue to play an active role in the education of children and young people. 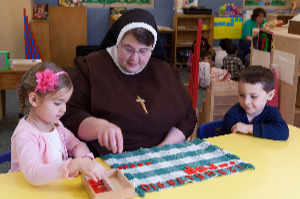 In addition to the Felician-sponsored early childhood education centers, Montessori schools, high schools, and universities, we serve as teachers, administrators, campus ministers, and more in schools across the continent. Our early childhood education centers encourage each child from an early age to strive to reach his or her fullest physical, spiritual, and intellectual potential. 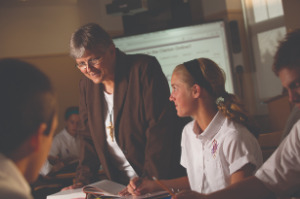 Our college preparatory high schools encourage academic excellence in an environment imbued with Franciscan spirit and rooted in the Gospel message. We are also a vital presence in a number of other secondary schools, such as Bishop George Ahr in Edison, New Jersey; Pomona Catholic in Pomona, California; St. Augustine in Laredo, Texas; and Saint Pius X in Albuquerque, New Mexico. In our institutions of higher learning, students receive a distinctively Felician education. Each school embraces and celebrates its commitment to service, giving students opportunities to serve the needs of others.